Orange has recently contributed to the Cloudify project. A newly created repository on GitHub contains the TOSCA file and scripts to needed to deploy and manage a MetaSwitch/Clearwater vIMS on an OpenStack platform. The aim is to propose a full life-cycle management of the vIMS. Cloudify is an open source cloud orchestration platform, designed to automate the deployment, configuration and remediation of application and network services across hybrid cloud and stack environments. Clearwater’s built-in TAS enables you to offer voice and video calling services, Call Forwarding, Call Barring and Caller ID / Privacy services. By incorporating design patterns and open source software components, Clearwater achieves an unprecedented combination of massive scalability and exceptional cost-effectiveness. For the moment, only one open-source code exist to deploy Clearwater with Cloudify and Chef. This blueprint is used in the OPNFV functest project. The goal of Functest consists in providing comprehensive testing methodology, test suites and test cases in order to test and verify OPNFV Platform functionality that covers the VIM and NFVI components. 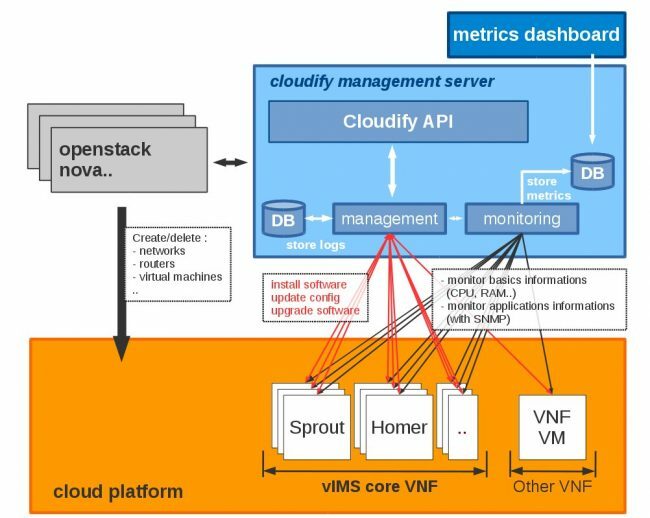 The goal of this test case consists in deploying and automatically testing a distributed vIMS based on the Clearwater solution within the OPNFV continuous integration. Find Cloudify Clearwater on GitHub. The code is published under Apache License 2.0.